"The reformist parties, trades unions and employers have coalesced to obstruct any growth in the level of the struggle, or any conquests that could lead to a revolutionary transformation. The proletariat have only one alternative: !" The increasing contrast between the real workers' movement and the 'official' spokesmen (parties of the left, trades unions, etc.) is a direct consequence of the latters' failure to fulfil their professed task of freeing the workers from exploitation. Every day that passes demonstrates to whoever wants to see it that these organs have no intention of challenging the basic structure of capitalism, and are now making quite unashamed appeals to the workers to make sacrifices, accept unemployment, wage cuts, increased prices, and so on, in order to save the economy for their employers. Strangely, those who seem most reluctant to see things as they are, are the conscious minority where even anarchists are still discussing whether or not we should be 'working within' the trade unions, or proposing to build alternative but essentially similar structures. It is to this minority that we propose the following articles. The subject is not new, but is being experimented daily in the immense variety of trials and errors put into effect both at individual (absenteeism, sabotage, etc.) and mass (wildcat strikes, rent strikes, squatting, etc.) level, by those who suffer the brunt of exploitation directly: the low paid workers, the unemployed and other emarginated minorities, those for whom autonomous organisation is not a choice among others, but a necessity at the very level of survival. This leads to the problem of the role of the anarchist minority within the workers' movement. Does the anarchist, refusing the role of leader or vanguard, have a role to play within the mass movement? This is a problem that needs going into in depth. There seems to be a fear among many anarchists to do so, often leading to situations of total inertia even in the face of struggles where an anarchist presence would be of considerable significance. The direction our work takes is conditioned from the start by our attitudes and analyses, no matter how unsophisticated these may be. In recent years the libertarian movement has come to take for granted certain assumptions concerning the working class and the struggle against capitalism, which if gone into can be found to have their roots in the Marxist theories. This has led to workerist attitudes (idealisation of the industrial worker, disdain of minorities and the so-called 'lumpen proletariat', and an economistic vision of the class struggle), and sterility of ideas and action. It is not a question of theoretical purity, but the more serious problem that the means we use condition ends to be attained. -200This is the main theme of the first article, where Alfredo Bonanno questions the 'scientific' and 'rational' Marxist analyses, reminding us of the great influence which Hegel had on Marx throughout his work, and the not inconsiderable 'idealist' element which this alimented. In the place of Marxist metaphysics we must employ our efforts in developing a pluralistic analysis based on concrete factors which are constantly modifying the relationship exploitation/struggle. 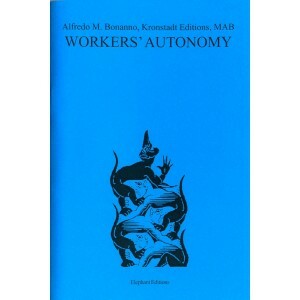 But as comrade Bonanno continues, we must take into account not only the objective causes of oppression, but must also examine the subjective factors which play an important role in the persistence of exploitation and are hindering the process of workers' autonomy. One of the main factors is what he defines the 'religiosity' of the masses, causing them to solicit a 'guide' or leader. Another subjective obstacle in the path of workers' autonomy, and therefore of social revolution, is the set of moral values inherited by the industrial workers from the bourgeoisie, which creates a division between skilled and unskilled or unemployed workers, and exalts the work ethic, guardian angel of production. In the two articles that follow, prepared by the comrades of Kronstadt Editions, the essential theme is the role of the anarchist minority in the autonomous struggle of the workers. If this could once be considered that of working to build syndical structures or workers' councils, time has demonstrated how these organisms cannot reach a truly revolutionary perspective, but remain tied to a precise vision of the economy (that of a quantitive consideration of production), and their perspective as organs of counter-power. The concept of workers' autonomy bases itself on a qualitative change in human relations, not a simple change in the ownership of the means of production. This involves taking in a global vision of the struggle and not restricting it to that of the factory or the demand for more jobs, hence the concept of 'territory', covering in addition to the workplace, also the living area, the school, the land, and so on. Within this global reality every individual finds his or her dimension through direct struggle, without passing through the intermediary of party or trade union. Another point they raise is that autonomous struggle cannot be imposed from the outside (as it would then be autonomous in name only), but there must be a disposition within the people in a given situation to act in such a way. The work of the revolutionary minority is therefore not that of trying to form autonomous mass organisms, but rather that of measuring the potential for such to come about, and trying to increase that potential through actions which are relative to the situation. Needless to say, the phenomenon of workers' autonomy is attracting the attention of parties who feel the way the wind is blowing and have an interest in trying to insert themselves within this movement in order to instrumentalise it. This is another place where anarchists come in: to expose such attempts, and for this we must be clear ourselves, and wary of subconscious attempts to see it as a potential for the growth of some fictitious anarchist movement. The fourth article, by the autonomous movement of the Turin railway workers, the MAB, is a document which has grown from a concrete situation, an attempt by some of the railway worker comrades in that area to organise in the form expressed in the document: in autonomous workers' nuclei, free from the interference of trade unions or parties.